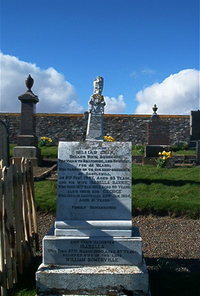 William Gunn Dunbeath postman to Braemoor and Houstry died 9th fep 1937 aged 63. Wife Isabella Barnie died 15th March 1963 aged 89. Son George Gunn died in Australia 23rd January 1954 aged 51.
d Isabella Gunn died 27th March 1990 aged 87 wife of late William Somerville.